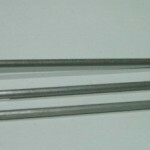 PRODUCT DESCRIPTION: 30" long rod which attaches to the FIRE ANT KILLING AEROSOL. It has a lateral dispersing tip so that when you stick it in a fireant mound and treat you get excellent distribution of the spray. The wand comes in three equal sized 10 inch lengths and screws together. Though strong, it can get damaged if you try to force it into hard dry ground. For this reason it is best if you use it following a rain or after the turf which you are treating is soft from irrigation. Staking holes prior to injecting using our STAKING TOOL will allow for deep and much needed penetration as well as prevent damaging the wand. The Staking Tool is designed for such situations and can handle a lot more pressure for getting deep into the mound so be sure to use it if you are in a dry arid area or if you have a lot of mounds to treat. WHERE TO USE IT: Directly in the mound. It is best if the stake holes are angled at about a 70 degree pitch so that when the wand is injected the Aerosol will still be relatively flat. This will allow you to get all the product out of the can with little or no waste.